Just bought a Honda Insight model trend (2014) and I like to get good MPG's from it. As the car didn't see a garage fo a long time, I only see -9999 in the the display. So no info about the MPG of the last trip. Within two weeks this will be solved by the Honda dealer. Another thing is, I like to make it plugin to a certain degree. I will have to work it out. Hi Laszlo, welcome at Ecomodder. If your car is a true 2014 Insight you do not need to worry about oil consumption. The 2012 and early 2013s had a piston ring problem, earlier and later Insights don't. The problem is mostly limited to the USA, it may be fuel dependent. But Belgian member 'Rode Schicht' at HondaHybridClub.nl &bull; Index page seems to have it too. He experimented with thicker oil, to no avail. Honda acknowledges the problem and issued TSB #16-101 to repair the issue. You should contact Honda to find out whether your car is in the range or not. Loads of info on InsightCentral.net . I tried my hand at a plugin conversion for the Insight, even have my own thread. The Insights hybrid battery pack does have 2 terminals well hidden in its internals, but it does sense abnormal current flow. 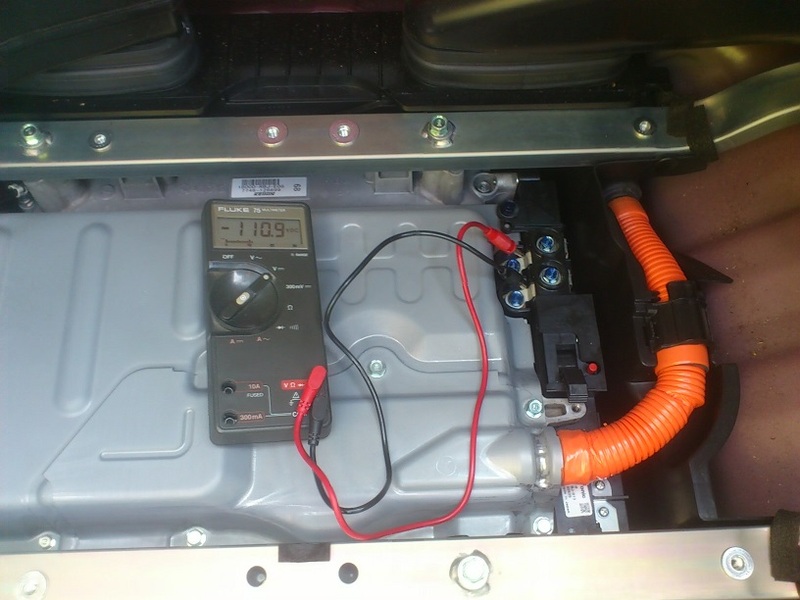 The pack is able to produce 55 Amps at 116 Volt, but the Insight throws IMA fault codes if hooked up to it. If you contact on while the pack is connected it will also immediately throw an error. It does not show specific IMA data, sadly. Retepsnikhep at InsightCentral.net has made a device that does just that for the first gen Insight and was planning a version for our cars, but housing projects got in the way. I have used a lamp shunt to limit current, which works to some extent; the buddy pack draws to near empty in about 5 hours of driving. It does shorten or prevent the mild recharge that happens after speeding up to merge the motorway, and it may prolong the EV mode in slow zones a bit. The overall effect on fuel economy is marginal. I am not using the buddy pack now, but am planning a revised version with volt and amp meters in the car, a diode bank to prevent back current on deceleration and ideally an adjustable current limiter. 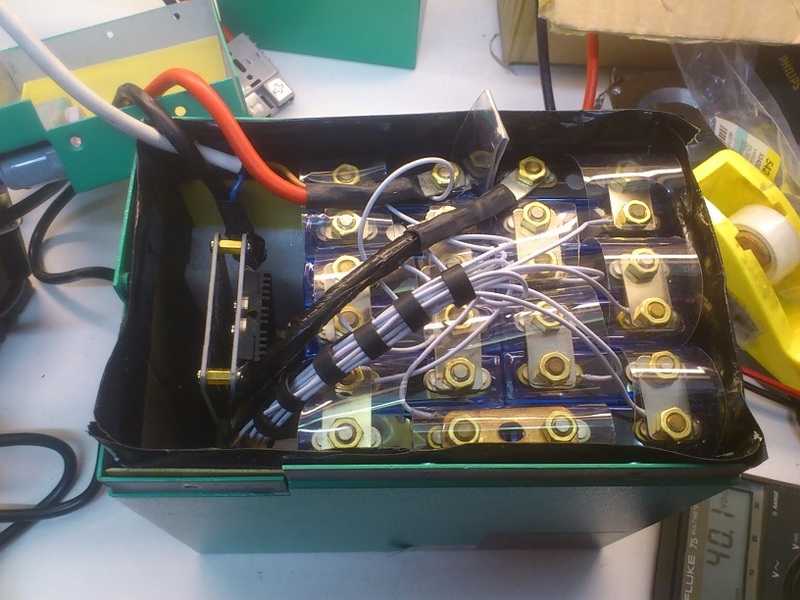 If I lose heart on the project I may rebuild the cells into a 12V pack to replace the lead acid battery and prevent the car from charging it, to do that at home or with a big PV panel instead. That setup won't throw IMA codes and solve the Insights weakest point - that lead acid battery... If that goes the car throws all kinds of weird errors, as one by one the systems detect malfunctioning due to low voltage. Even the IMA control system is powered by the 12V battery! I therefore monitor the battery voltage on my UltraGauge almost as vigilantly as the economy readout. Last edited by RedDevil; 03-25-2018 at 04:14 PM.. Reason: 'VIN' has an N... VIM is an abrasive cleaning powder! Thank you for putting so much info. Green oil and good tire pressure will be a good start. The right foot then is the next step. For what about the buddy battery pack.. In will not rush into it. I will try to investigate first. My idea is a kind of a charche pump. A PWM modulated switch (MOSfet) and a coil in series to feed in on demand from a 117V source. THat is, if IMA needs current from the NiMh pack and SOC < 60% or so, I will feed in to a certain ammount. If the IMA collects current, I do nothing. A diode will block reverse current. This way I will feed in where the unload voltage curve is quite flat. This I hope would give the least ammount of conflicts with IMA. But maybe it's all worth nothing. For the next coming months (I do things slowly) I will try to collect some voltage amp curves during testdrives. Hoping for some insight. I don't think the SOC will go down as low as 60% often. In my experience, the IMA system keeps the SOC high most of the time, even more so when you're trying to feed it. My lamp shunt has a relay that switches the lamp banks in series instead of parallel when the current gets too high. I can hear the clicking of that relay plus at night I see the glow of the lamps, and most of the time they are just glowing dark amber indicating just a few Volt difference between the buddy pack (at 117-ish Volt) and practically no current. Then when accelerating or using EV mode they go full bright, click - parallel, still quite bright; would be close to 100 Volt then. I'd love to use a MOSfet current controller but haven't found what I need yet. I can build one if I have a design, but to design one is pushing the limits of my knowledge and confidence. Ah well. Today I freed up 2 meter of 5-wire ground cable from a disused garden power outlet that led to worn garden lighting and a burned-out pool pump. That cable should be sturdy enough to safely carry the voltage and current feeds from the battery to my digital readout in the center console plus the relay control. I'll put 1 megaOhm resistors on the feed side just to be safe anyway; even if it does short the current would just be a trickle. I had to remove a latch from the garden power outlet to detach the ground cable without losing length. So I removed the latch, poured out the water and detached the cable. Poured out the water, yeah. Leads all corroded and ionized. I have never been keen on outdoor electrics, that has not changed one bit now. Last edited by RedDevil; 03-25-2018 at 04:23 PM..
You did a good job so far. It looks sturdy and safe. Next weekend, after eastern I will try to make a MosFet controller design. The trick is to keep it simple. I did not yet tear the car apart. So I don't know if I can find the power cable going from the IMA battery. What I am thingking of is this: Use a clip-on hall sensor to measure the current from the IMA battery. It is a bit costly, € 60,- , but non-invasive. Do you know the diameter of the factory installed power cable? Is there a good place to fit it? Next thing is the High Voltage circuit. A P-channel MosFet, a coil, 2 diodes and a in- circuit (cheaper) hall sensor for current meaurement. This is luckily quite simple and not expensive as motor controller components are very common today. And at last the low voltage decision and switch steering unit. So we have two current sensors. One is the IMA demand the other is the delivery from the buddy pack. Now we have to switch with some hysteresis to deliver on demand for a certain percentage. It is possible to keep it analog with a few opamps and with a few potmeters added you can tweak the current and hysteresis and so on. Thanks! I'm anxious to see what it will turn out like. I was planning on using a simple shunt as my amp meter needs it. Note that the positive terminals are the pair closest to the rear bumper. The pair behind them (e.g. closer to the rear seats) are the negative terminals. Note these terminals are switched by the IMA system, but nonetheless retain some voltage shortly after key-off. Also it will throw an error code if any voltage is on these terminals when you key on! My harness has relays that sit right on top of the terminal connectors so I can disconnect them before I key on. Version 2.0 will have the (dis)connect switch replaced by a tiny relay operated by push-buttons so it will be automatically off on startup. Prior to a scheme for a mosfet switched circuit I tried to model your setup to see if there's any profit to get with a switched circuit. a diode setup is very simple and simplicity is most of the time key to success. What I tried is making a schematic model in LTspice. What you can do if you like is install LTspice (google LTspice download, it should be from analog.com) unzip this attachment and open it. You can play a little with the model. At the left side is the buddypack, at 3.2 volt x 36 = about 115V Internal resistance of your pack guessed at 8 mOhm for each cell, might be lower also. It was not my intention to model the pack in detail, just keeping it simple. At the right side is the motor current. Right click will open a time table with seconds and currents. This way I model a 15 minute ride, but not too realistic at the moment. A little left from the motor is the IMA battery pack, I found somewhere that the civic had .4 Ohm internal resistance. With less cells in the Insight II a 0.24 Ohm internal resistance should do. The capacitor resembles 15 volts linear loss when pulling 80% = 4.6Ah from it. Something between brand new and older. The bulb you used was a bit more difficult. These halogen things have a low resistance when cold and it raises when hotter. I got the values from google. 4A at 13.75 Volts = 3.75 Ohm and only 10% when cold. From this we can see what happens during the ride. In the enclosed picture the starting voltage of the IMA pack is 110V. As the voltage difference with the buddypack is low, there's not much current. Current raises when the motor it pulling the IMA pack down. Next week (if i'm not too busy) I will try to model the mosfet circuit instead of the bulb and diode.